Susan took this huge show from casual chaos to orderly charm. When Susan started in this position artists were still sharing a 10’ x 10’ booths and the result was chaotic. 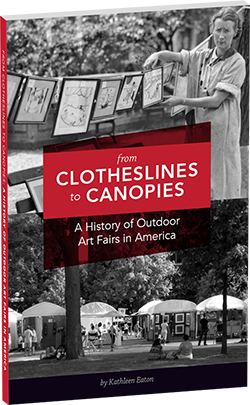 During the 1980s the transition to canopies became the norm and artists were no longer content with sharing a booth with another exhibitor or leaving control of their exhibiting environment to other forces. As director she oversaw this important transition to single booths, as well as inducing the fair to become a not-for-profit 501C3, implementing the sales of art fair related products such as T-shirts and hats, the introduction of limited and appropriate corporate sponsorship, and developed the option of festival tents for exhibitors who did not want to bring their own canopies. This was all done while keeping the focus on excellence in art as well as creating a congenial environment for exhibitors. After three years of research and careful planning the Cherry Creek Festival started out strong and has continued to be one of the best shows in the country. In order to bring artists to Denver the show offered an exceptional degree of hospitality to exhibitors from its inception. Additionally careful attention to publicity, corporate and other community support, the mechanics of show production, and an emphasis on the value of art have contributed to this outstanding festival. Bill Charney’s vision changed the business forever. After leaving his directorship he remains active and is well known in the nonprofit section as a consultant in board governance. Learn more at www.bcharney.com.